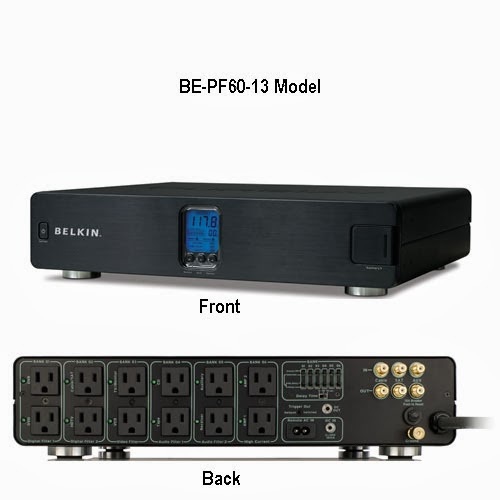 MEASUREMENTS: Belkin PureAV PF60 Power Conditioner. 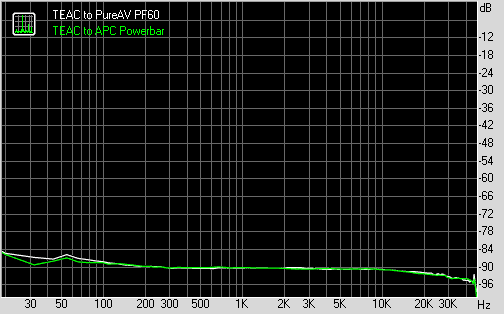 After the negative results for the measurements of the Synergistic power cables earlier this month, I thought I'd just end the month with more power 'tweaks' and do some measurements of my Belkin PureAV PF60 "Home Theater Power Console". Currently 119.6V, 2.7A being drawn. I think I paid about $250CAD for this back in 2007 or thereabouts so it's not new at this point. It certainly has served me well as a 13-outlet fancy powerbar with surge protection. You can check out Belkin's webpage on this item and get the mumbo-jumbo sales talk. I have no idea what a "Level 4" power protection is or what a "Phase 6 PureFilter" does or in what way the "HiCurrent" outlets differ from the others. I do as it says and plug my TEAC UD-501 and Transporter into the "Digital Filter" bank, the 2 monoblock amps into the "HiCurrent" ones, etc. The extra outlet on the front has been convenient as well to plug in the occasional charger or for the laptop. The main display up front tells me the voltage and current being drawn. From my listening position I can't really read the display well so I usually keep the blue LED dim so as not to distract. 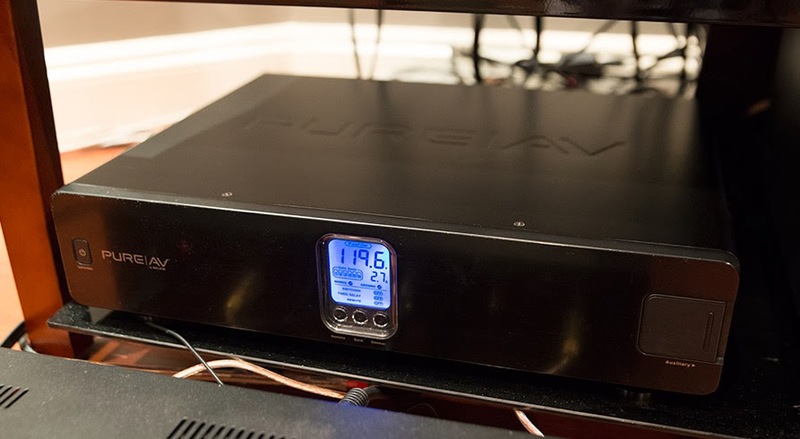 The test is simple - how does the TEAC UD-501 measure either plugged into the PureAV PF60 vs. plugged into a reasonable surge protected powerbar (APC P7V ~$25 in this case)? To create a bit of noise in the power system, I turned on the 2 Emotiva XPA-1L monoblocks, Emotiva XSP-1 preamp, LG 55" 3D HDTV, Onkyo TX-NR1009 receiver, Transporter, Behringer DEQ2496, gigabit router, all the pot lights in my sound room on. The amps, preamp, AV receiver, Transporter were plugged into the Belkin PF60. The TV, gigabit router, Behringer DEQ2496 were plugged into the APC P7V powerbar. The audio system was playing some Simon & Garfunkel at moderate volume through the Transporter during the testing. Well, nothing much to see here folks... Really minimal differences between whether I plugged the TEAC DAC into the "fancy" Belkin PureAV or the inexpensive surge-protected powerbar. I did the test around 10:00PM so maybe the power line at this time of the night wasn't all that noisy here in Vancouver. The Belkin PF60's squiggles actually show a little more noise than the inexpensive APC powerbar... Likely just small inter-test variability and I didn't bother measuring a few times since the difference was so minor. It's also possible that the 2 monoblock amps and the Onkyo receiver plugged into the PF60 were noisier. However, I would have thought the 55" TV plugged into the APC powerbar is just as noisy. Subjectively, likewise, I didn't hear any difference whether the TEAC was plugged into the PF60 or the inexpensive APC powerbar listening to Simon & Garfunkel's Bridge Over Troubled Water through the TEAC DAC. 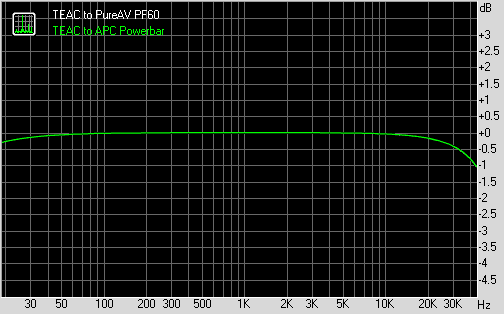 As usual, I would love to see some measurements: real-world demonstration of power conditioning making a significant difference to a good DAC's noise floor for example. Been listening to more multichannel music lately. The audio high point of the week was being surprised the other night by how good the multichannel mix for The Carpenters' Singles 1969-1981 SACD (2004 release) sounded! Proper placement of Karen Carpenter's voice up front in the center, good balance of front-to-back volume. For an example of a poor surround mix - Neil Young's Harvest (2002 DVD-A); what's with the surround channels sounding unnaturally loud? Time for some weekend R&R :-). Off to see Wynton Marsalis tomorrow night... Enjoy the music everyone. A couple weeks ago in the post on the Philips Golden Ear Challenge, I touched on the topic of hearing acuity and the importance of this. It's one of those things that seems to be taken for granted in the press and in audio blogs/reviews as if everyone who writes on high-end audio is capable of these feats of perception. This week, I thought it would be useful to consider the topic of "silence". Music grows out of silence. Without silence - or to more accurately put it; a low noise floor in the listening room - it would be difficult to detect very slight "microdynamic" changes. Even if one were to pump up the volume, nuances can be missed. In part, this is why the "dreaded" dynamic range compression (volume compression) is used. It reduces the dynamic range such that even very "soft" detail is pushed up in volume allowing detection of these details on the subway and in cars (remember back in the day when we had "loudness" buttons on car music players? ), as well as qualitative psychoacoustic preference to some extent. There is a limit to how far volume can be pushed in that at some point, we experience the sound to be intolerably loud or the hardware starts distorting - remember to always protect your hearing. Important characteristics of accuracy in reproduction - tonal neutrality (uncolored), and precise conveyance of detail (combination of good dynamic range & timing accuracy) - demand that the room be isolated from external noise as much as possible. 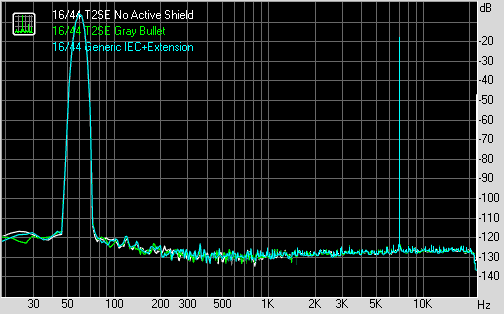 It'd be a shame to listen to high quality audio at reference 75-80dB level but 50dB of that is affected by noise! Even worse than consistent background hissing, humming, or rumbling is random or episodic noise like frequent cars passing by or people talking outside distracting the virtual "concert". Not on the list: AT&T-Bell "Quiet Room" = 10dB(A). Orfield Labs "quietest place on earth" as per Guinness = -9.4 dB(A)! Nobody (that I know of!) advocates listening to music in an anechoic chamber of course. In a domestic sound room environment, your best bet for a quiet room would likely be in a basement behind closed doors unless one listens in the dead of night away from street car noise and domestic hustle and bustle. 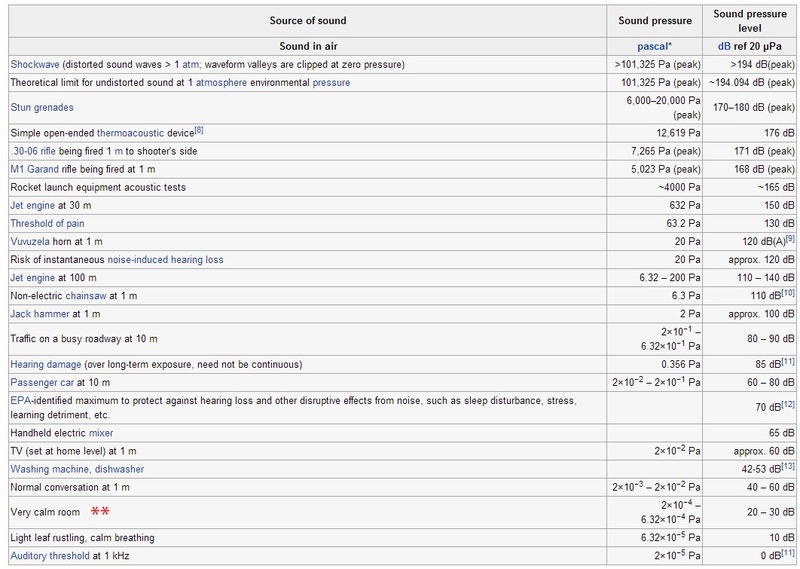 The professional standard for ambient noise is usually around 20dB(A) for the recording studio (check out this EBU Tech 3276 document for the gory details). As indicated by the red asterisk in the chart, we should try to aim for a very quiet 20-30dB SPL in the listening room; similar to the environment that the pro sound engineer would use as the reference. I installed Windows 8.1 Pro x64 on the system. Due to the oversized CPU cooler, I'm able to run the 120mm fan essentially silent between 20-30% speed and this is the only fan in the whole unit. No problem running 50 iterations of IntelBurnTest without any errors at "Very High" stress level while staying cool (I like using this program for stability testing more than Prime95; generates lots of heat within minutes). So far, I've streamed a couple of MKV 1080P movies in excellent quality 20Mbps H.264 plus DTS soundtrack - no problem at all. I also installed JRiver 19 and foobar as I described in that last HTPC article and have no problem streaming DSD64/128 to the TEAC UD-501 using USB2 and 5.1 multichannel FLAC to the Onkyo receiver through HDMI. 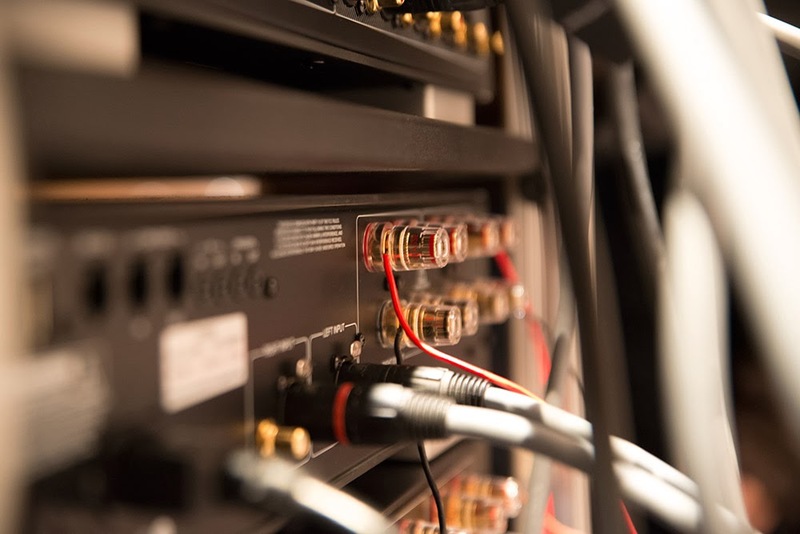 The Squeezebox system (Transporter, Touch, Boom, Radio) connects directly to the Windows Server machine and has nothing to do with this HTPC. 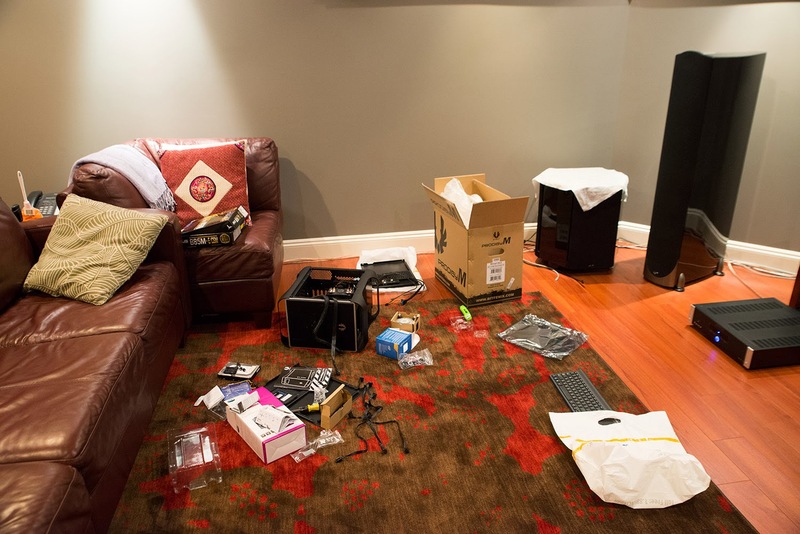 Quiet room, 10:30PM: HTPC/pre-amp/monoblocks/subwoofer/TEAC DAC/Transporter/room EQ DSP all turned on. Not bad. It can dip down to the 28's and up to ~31 over the course of a few minutes of measurement. Good enough as a ballpark estimate aiming for the 20-30dB target. Using C-weighting (which is a more linear response profile vs. A-weighting which corresponds to human hearing), I'm seeing ~33dB(C). Prior to this new HTPC build, I was seeing about 35dB(A) with all those hard drives spinning. Even though the ambient noise level is low, my room still has not been treated with acoustic panels so the room reverberation time remains a bit high. EQ'ing has provided a reasonably flat response described previously (+/-5dB around the target Brüel and Kjær "house curve" with recent digital EQ tweaks). Absorptive acoustic panels remain on my radar screen - I'm still contemplating aesthetics. 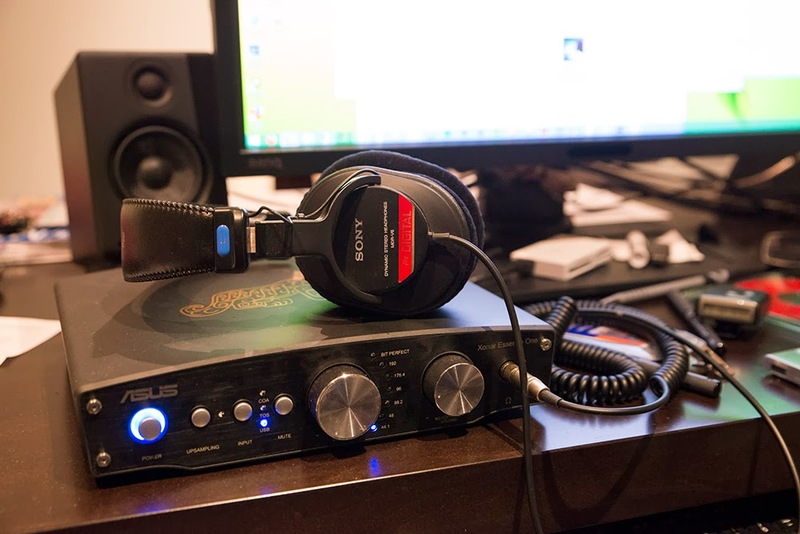 I want to end this post on a more serious note (as much as I enjoy the topic of audio, it's only a hobby after all!)... 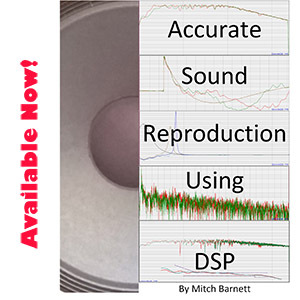 I want to send my regards to Matt Ashland, the CTO of JRiver, the principle developer of Monkey's Audio (APE format - probably the most space-efficient free lossless compression system), and contributor to the DoP protocol (DSD over PCM). As some of you know, he had a fall in January and required surgical evacuation of intracranial bleeding; still recovering in hospital. I had the pleasure of exchanging E-mails with Matt last year around the time of the beta JRiver 19 release regarding the PCM to DSD transcoding algorithm, DST decoding, some bug fixes to JRiver, and his summer vacation with his kids. A truly genuine, generous gentleman and one of the unsung heroes of the computer audio hobby... My thoughts and prayers are with you and the family, Matt. Get well soon. Matt has a CaringBridge page. Given the price and performance of this CPU, I can't imagine any reason to build anything less powerful these days. I think it would be no problem running this fanless with a good sized heatsink if I underclocked it even further; 2GHz dual core with lower voltage fanless probably would be totally fine! Under immense market forces and thin margins for the majority of consumer electronics, it is no wonder that the specialist brick-and-mortar stores have gradually disappeared over the years. Big box stores are everywhere these days it seems (Best Buy and Future Shop here in Canada), and the proliferation of internet "stores" like Amazon has clearly taken centre stage for the consumer on the prowl for the best deal available. In some areas like the AV receiver market, I believe market forces have clearly resulted in marked improvements over the last 10 years in sound quality and meaningful features representing great value (think HDMI support, room correction, proliferation of lossless formats like TrueHD and DTS-HD MA). For audiophiles, I believe the main hardware developments in the last 10 years have to do with the quality of external DACs and software for better integration of computer audio into the sound room. The ascent of Class-D amplifier technology has been substantial as well but I doubt many audiophiles see a need to migrate to these amplifiers purely by virtue of this characteristic (unless of course you need higher efficiency, smaller size, cooler operation, etc...). 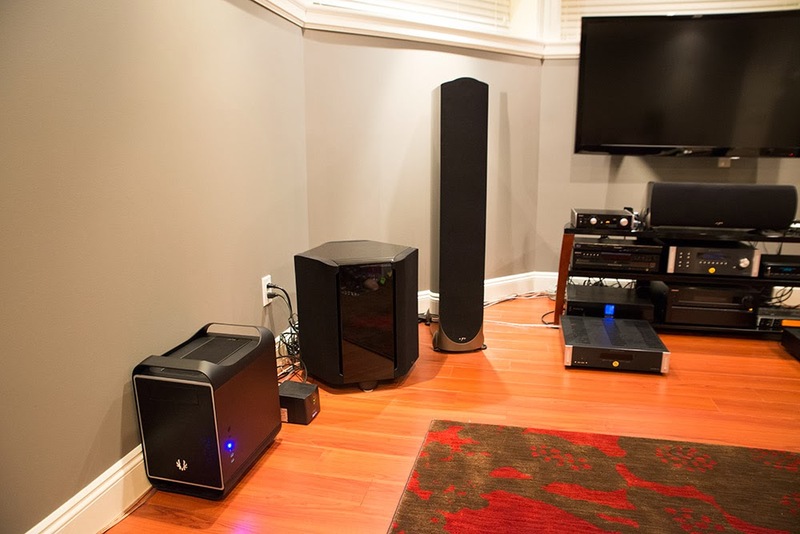 Likewise, speaker technology has advanced especially in the material sciences used for drivers, but I think it's hard to justify new purchases based on this factor since there are so many other variables in the overall sound quality (like your room!). 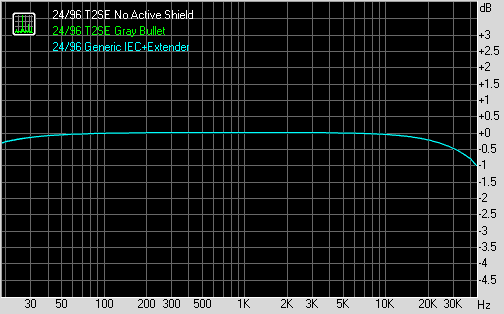 I don't blame the small audiophile stores for pursuing to sell gear that have big mark-ups. Things like cables easily come to mind and it's certainly in their interest to promote these products and give them ample "rack space" for potential customers to peruse especially if there are manufacturer incentives - I just hope there is balance between the concept of aesthetics and sonic performance being presented. Likewise, magazines have to sell copy and attract advertisers, what other option do they have? And you can bet again the power of the manufacturers/advertisers in promoting products even if said product is of unlikely benefit for the customer. Without adequate financial viability, there is no business. 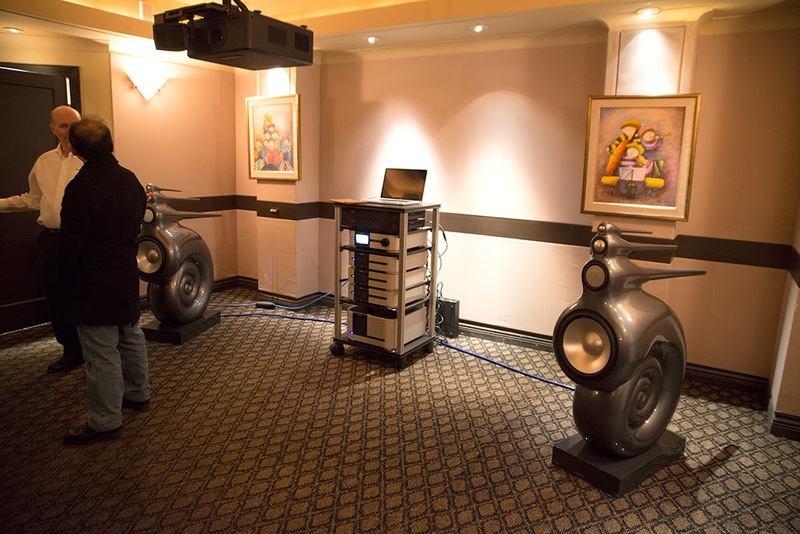 In Vancouver, there are probably only about a handful of hi-fi stores left where you can even have a hope of sitting down to listen in anything remotely resembling a decent listening room. Thankfully they still do exist and on occasion, it's nice to visit to check out (and of course purchase) the products, perhaps demo the exotic gear, and interact with knowledgeable salespersons (ok, salesmen - who am I kidding?!) who clearly show a passion in the hobby and in what they sell. So, on a relatively cooler Saturday morning last week, I headed over to Hi-Fi Center (along Seymour just north of Dunsmuir) to have a look and listen to one of the most recognized speakers ever. 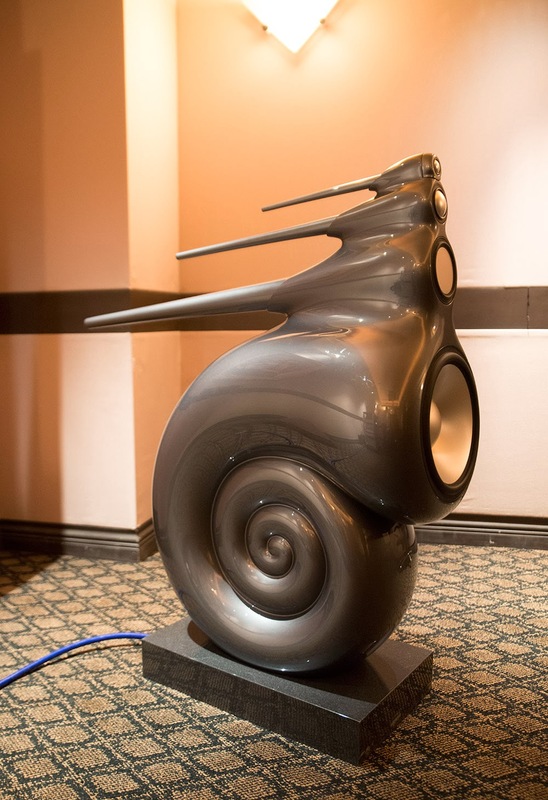 I, like many of you probably have seen pictures of the Bowers & Wilkins Nautilus speakers over the years but had never actually heard one. 2013 was the 20th year anniversary of this flagship product from B&W so they've been doing a tour through a number of cities since last year and it was finally time to hit Vancouver. The well done presentation with Q&A was made by Murray Cardiff, Canadian National Accounts Manager for B&W. 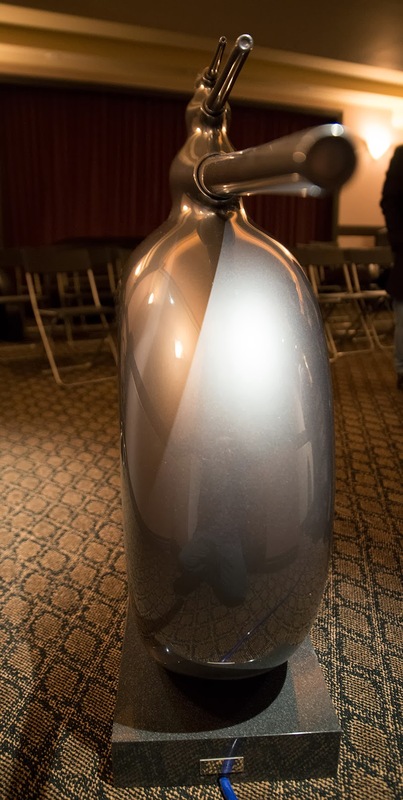 Now that's an interesting looking speaker - in "Maserati Gray". WAF was alas poor for me but I suppose YMMV. - First released in 1993 - no substantial change to the design / sonic characteristic since. Check out this video, and part two for more (also check out the epic background music)! I don't know how many speakers can be said to not at least have a "Mark II" by now. According to Murray, about 4 units are produced per month for sales worldwide; not surprisingly many to Asian countries. Manufacturing facilities in UK and China. - Current list price in Canada - CAD$70k a pair (includes external crossovers discussed below). I wonder whether there has been any price appreciation; I think the list price at release was ~USD$60k. - The shell of the speaker is made of a composite material. Each complete speaker package is about 200lbs based on the specification sheet - evenly split ~100lb for the speaker itself and the granite base it's "standing"/bolted on. They stand (only) about 4 feet tall. - 4-way driver configuration - 12" (300mm) bass driver (with characteristic mollusk shell spiral tube), 100mm lower mid, 50mm upper mid, and 25mm tweeter. Notice the tapered "transmission line" behind the upper 3 drivers. They're absorbent-material filled terminating with a small opening in the rear. 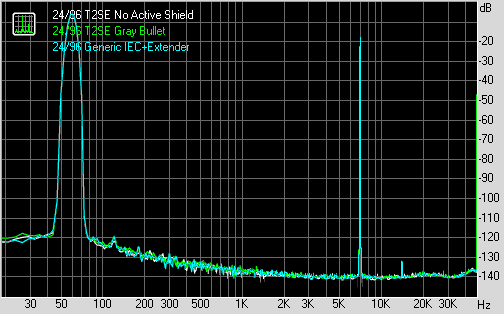 Frequency response widely quoted as -6dB from 10Hz to 25kHz. 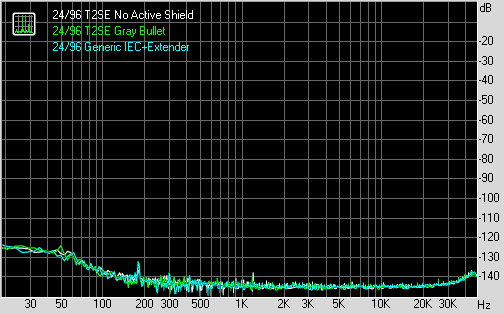 Crossover points: 220Hz, 880Hz, and 3.5kHz. 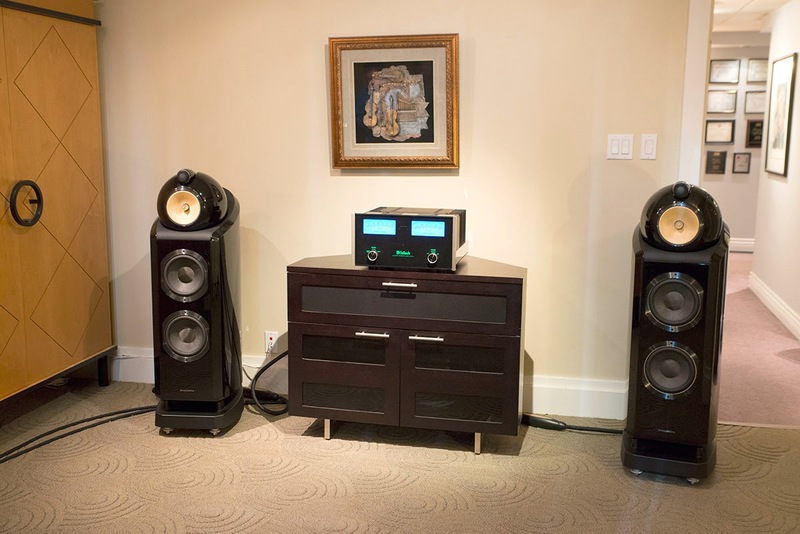 The speaker impedance is rated 8-ohms, no specification provided for sensitivity (somewhat meaningless anyhow in a set-up like this with external crossovers and separate amps as discussed below). - All driver domes made of aluminium. This gives away the >20-year old design from the perspective of material sciences. - There are no internal crossovers for the 4 drivers. You see the non-detachable blue speaker cable coming off the base. Another clue to the 20-year old design is just how thin the cable appears to be for something that contains 4 pairs of wires; a pair for each driver. The wires themselves are multi-stranded silver, and examining them closely, I don't think they're thicker than 16AWG and come in a standard 10' length (30' length also available). Of course this is technically not a problem at all for such a short length of speaker cabling but might surprise those who expect garden hose sized wire gauge for high-end gear! Bare silver multi-stranded speaker wires connecting amplifier to speaker (red & black). 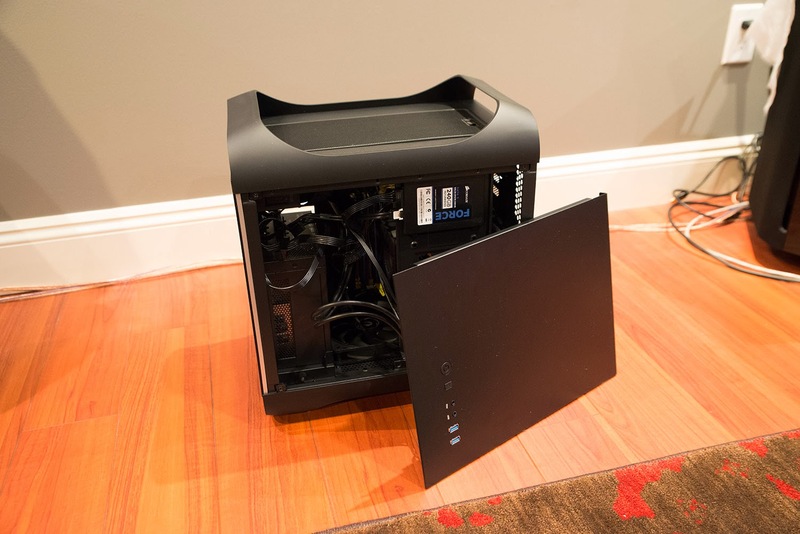 You see the black 2-box active crossover just below the computer. Below that with the LCD screen is the Classé CP-800 preamp which functioned as a USB DAC for the MacBook (it got a good Stereophile review, ~18-bit measured dynamic range, very low jitter). 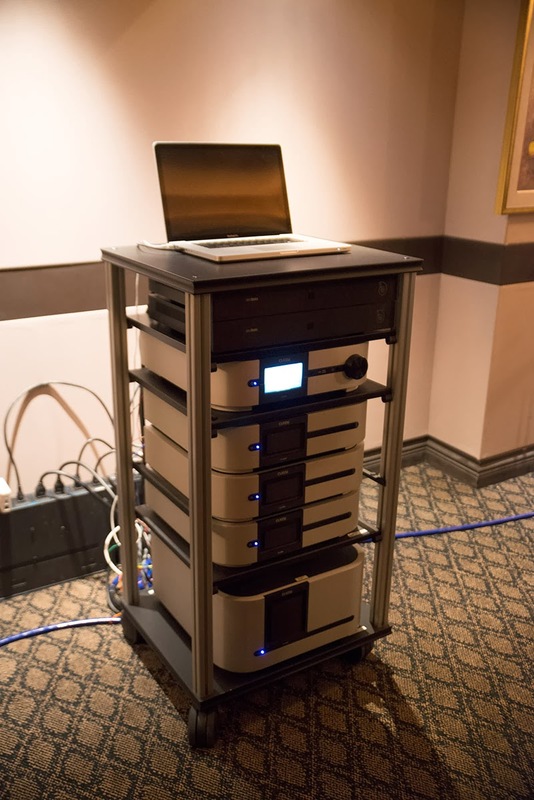 Below are 3 stereo class-D CA-D200 amplifiers, each 200Wpc powering the tweeter, upper and lower mid drivers. 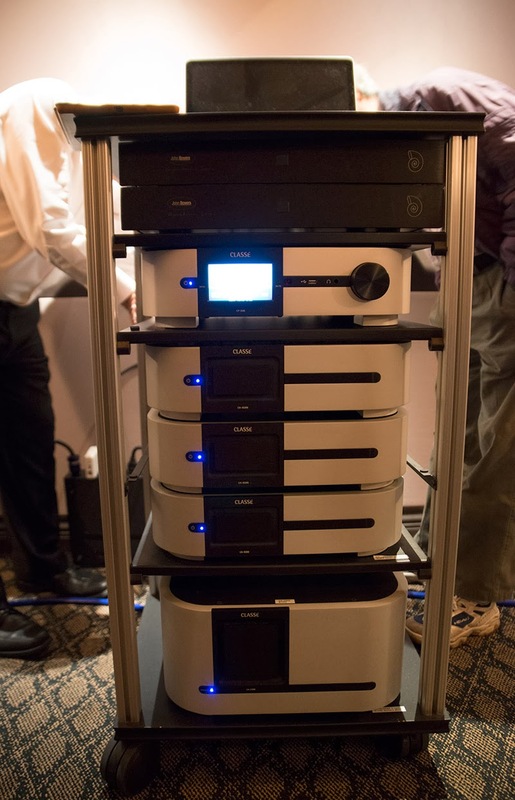 Obviously that stacking arrangement highlights a major benefit of the class-D amps - they stay cool. Finally below is the large class-A/B CA-2300 amplifier delivering 300Wpc into 8-ohms for the Nautilus woofer - I noticed a good sized fan on the back which stayed quiet. Unfortunately, I was not able to play a CD I had brought with familiar tunes. Nonetheless, there was a good selection of music on the Mac already and the demonstration ran through a selection of familiar music - Paul Simon (from Graceland), Sting (from The Last Ship), Aaron Neville (from Warm Your Heart), Lang Lang (Rachmaninov No. 2), Rose Cousins (Canadian girl from Halifax), Beatles, Daft Punk ("Lose Yourself In Dance" off Random Access Memories), Oscar Peterson (We Get Requests). There were also a number of classical pieces I wasn't familiar with. As usual with these demos, it's very hard to judge the sound given the importance of the room and the music used. On the whole, it sounded very nice. Good frequency reproduction from top to bottom. The upper end was very detailed and it was easy to discern low-level details including tape noise on analogue-sourced tracks and things like musicians taking breaths during classical performances (if you listen for such things!). I'm still a believer in a good subwoofer to tighten those lower registers however. Unfortunately, no hip-hop or rap was on offer in the demo so it was difficult to determine just what isolated beats down at 20-50Hz would have sounded & felt like. Another nice quality was the fact that the system could be pushed to high levels in a moderate sized room without a hint of strain with peak transients. I was struck by the soundstage. The stereo effect was good even somewhat off center and this set-up certainly conveyed good horizontal and depth dimensions. I've seen comments from Nautilus owners describing excellent sound due to minimal rear reflections and folks placing these speakers against walls and other reflecting surfaces. Some of this may also be a reflection (pun intended) of the external active crossovers doing an excellent job with subtle parameters like time/phase alignment. I heard a few of the attendees mentioning that the sound was fatiguing... Well, what can one expect when a good amount of the demo music was dynamically compressed?! Seriously, IMO, if these speakers did not convey the harshness of some of the tracks, then there'd be something wrong since that's just what the recordings sound like. Having said this, I did wonder if there was a bit of "ringing" from the aluminium tweeter which may accentuate the fatigue effect in some of the tracks (especially synthetic material like the Daft Punk)... I cannot be sure of this, just an impression. 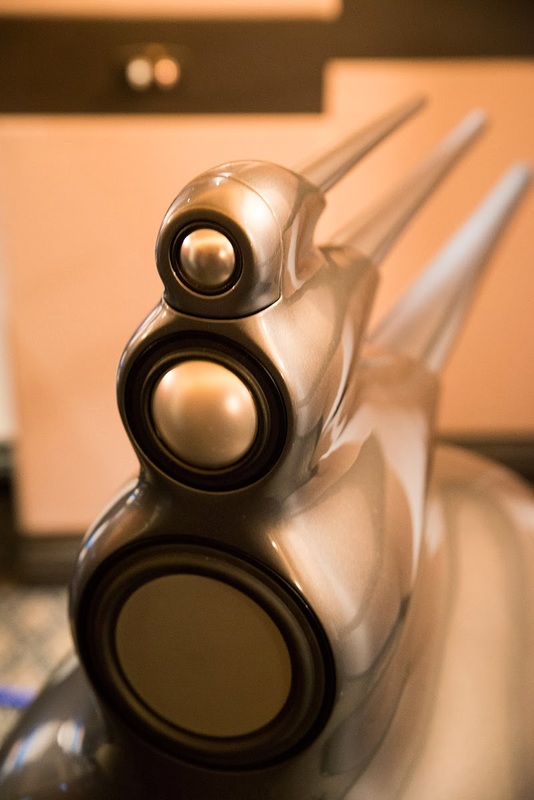 Obviously B&W has advanced over the years to using diamond tweeters while other companies like Focal, TAD, Magico, Ravel and Paradigm Reference are using pure beryllium to achieve higher breakup frequencies significantly above the audible spectrum. I suppose the use of class-D amplifiers could have an effect (likely not) - just don't tell me silver speaker wires sounds "bright" unless there's evidence of such a thing :-). B&W recommends at least 100W for these drivers and given the amplifier demands, I cannot imagine many folks running these with tube amps. I suppose NOS DACs and various upsampling DACs with rolled-off filter settings could tame the upper end at the expense of accuracy of course. As I mentioned earlier, I have never seen a full review on these speakers and would be very curious what measurements look like. As you can see, it's powered by a McIntosh MC302 300Wpc stereo amplifier. SACD player was also McIntosh. Really nice sounding as well, definitely goes deep although I noticed some low bass accentuation in that room (sounds nice and punchy but I would have used some EQ to tone down the bottom end a little). 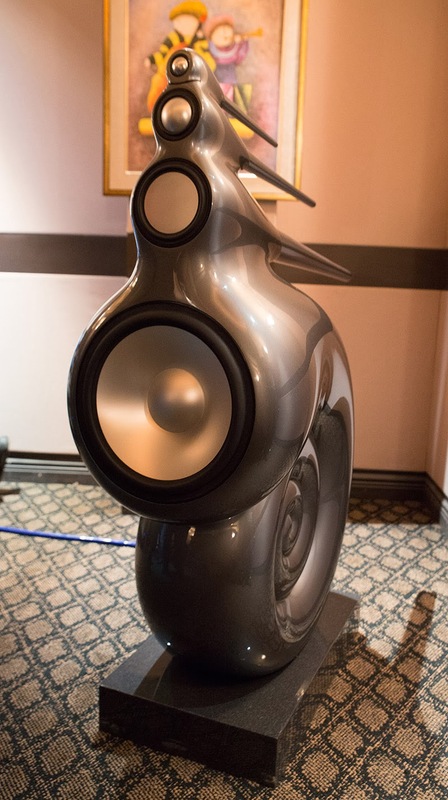 I had a listen to these speakers last summer in Singapore at The Adelphi, coming away with a similar impression of the excellent sound quality. I'd certainly be very happy with these at home :-). Don't you love the term "golden ears"? 5. 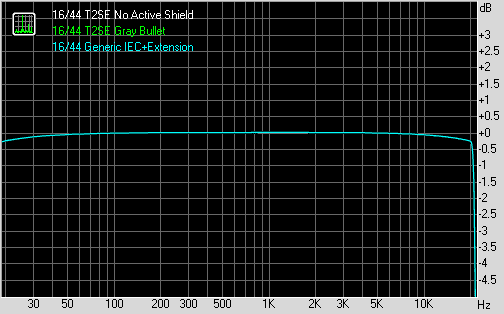 You must have good enough ears to appreciate the difference hi-resolution makes. I know this can be touchy for some folks, but it is what it is. Our ears (and brains), like all the other sense organs (and cognitive domains) do not have infinite resolution. And like everything else, time is not on "our" side. 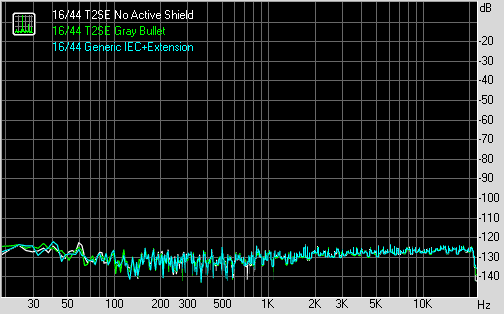 At 42 years old this year, my ear's "frequency response" only goes up to about 15-16kHz at normal amplitudes. 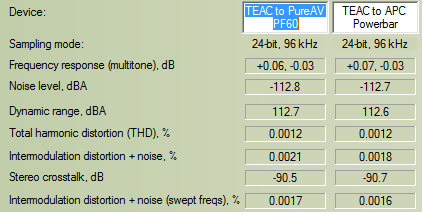 Do I really have the need to go for files with sampling rates of 88kHz+? Honestly, I don't think so... But as I've expressed elsewhere, this is about perfectionist audio so I'm certainly happy to have access to my favourite music using the most accurate technology available (I'm still of the opinion that 24/96 is more than I'll ever need in terms of the technical specs). 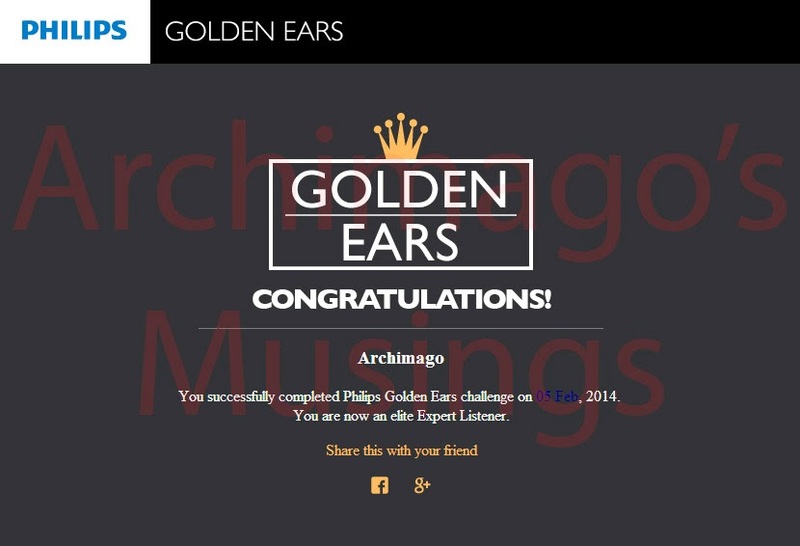 If you haven't seen it yet, recently, our friends at Philips have come up with a very cool website called the Golden Ears Challenge. Just enroll with your E-mail address and get going with some ear training. Log off and it'll keep your place in the test. Seriously, if you believe your equipment and ears are up to the task, take the challenge! I suspect some audiophiles will be surprised at the limits of their hearing ability. I took the Challenge using the ASUS Essence One on my desktop with a pair of venerable Sony MDR-V6 (<$100) studio monitor headphones. I figured, if the V6 is good enough for Roger Waters, it's good enough for me! I suppose better headphones like my Sennheiser HD800 and being in my much quieter audio room downstairs could have made tasks like hearing high frequency extension or detection of minor amounts of reverberation easier, but the computer desktop was more convenient... 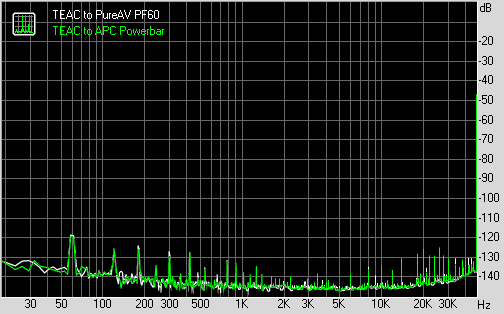 Remember to make sure the DAC is set to native 44.1kHz and something like Windows Mixer isn't upsampling. The Bronze level wasn't difficult at all unless one has hearing issues, I suspect. 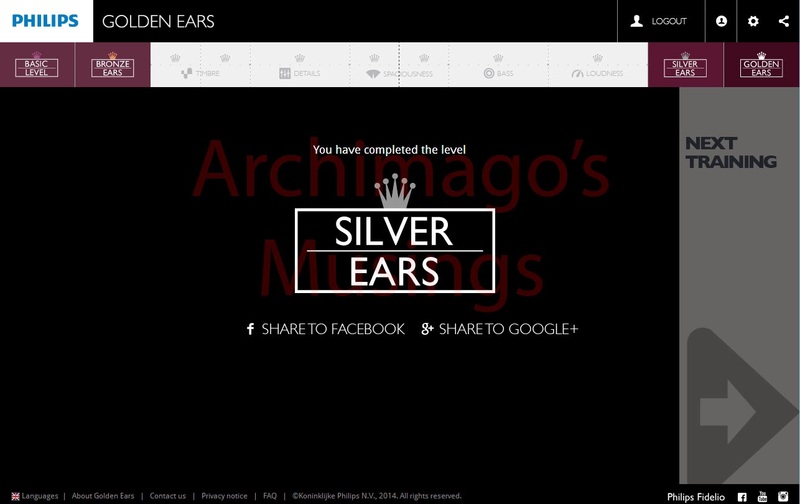 Silver level was achieved in one sitting. 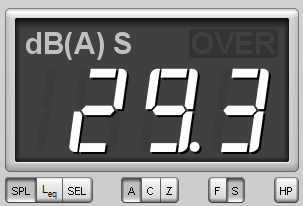 I think the test music samples were encoded with 320kbps MP3 and it wasn't too hard to differentiate between 320kbps and 128kbps lossy compression - as usual, listen especially to the treble and see if you can hear the loss of detail, more "brittle" rendering, and slight "chirpiness". I found it more challenging detecting small amounts of reverb down at dry/wet ratio of 0.15 later in this test. 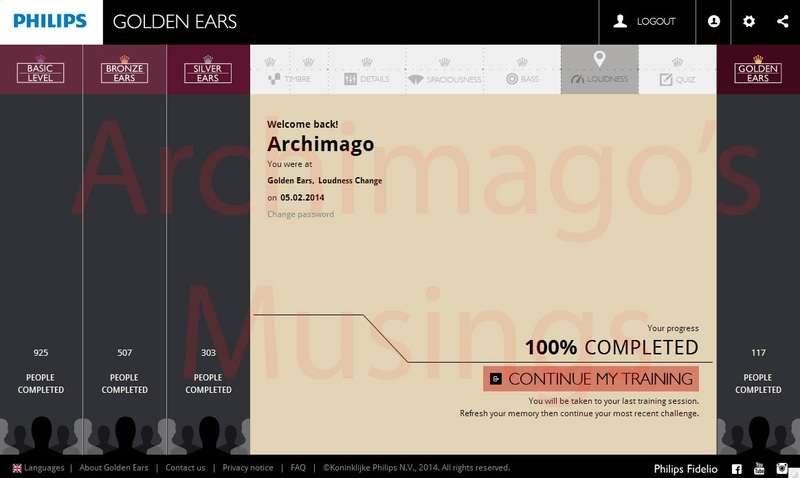 Here's the "coveted" Golden Ears achievement :-). You get an E-mail to confirm. Not bad, took my time over a couple of nights in between some virtual paper work. Achieved with a little patience and using the same ASUS Essence One / Sony MDR-V6 combination. The most time consuming part was getting the Boost/Cut Identification Test right at the various frequencies (63, 125, 250, 500, 1k, 2k, 4k, 8k, 16kHz). 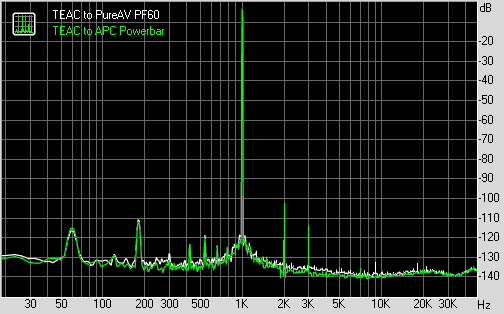 A frequency boost at 16kHz with real music was barely audible for me. Tests like the bass boost really benefits from headphones capable of good bass response so I suspect an open unit like my AKG Q701 would not be the best headphone to try this on. Not bad, looks like I'm one of 117 who have completed the Golden Ears level so far out of 925 who finished the Basic level (12.6%). Objectively, Golden Ears aren't that rare :-). PS: Remember that JPlay software I measured awhile back which made no difference (actually there was a bug in that version which makes it even worse)? Looks like they've returned with a line of "JCAT" hardware! USB cable for 299Eur, SATA for 349Eur! How about Cat 5e (!) for 349Eur - man, they didn't even bother trying for Cat 7; at least the AudioQuest "audiophile" ethernet cables did! Reminds me of sellers on eBay trying to scalp some bucks by listing items at huge mark-ups with "Buy It Now" to catch shoppers who have never tried "The Price Is Right". This time around, they don't seem to claim sonic superiority of these products - merely "help you create the ultimate PC audio transport and get the most out of JPLAY". MEASUREMENTS: Power Cable Redux. The Synergistic Research Tesla T2 SE, T3 SE and PowerCell 4. What we're looking at here is a "tree" of Synergistic gear :-). 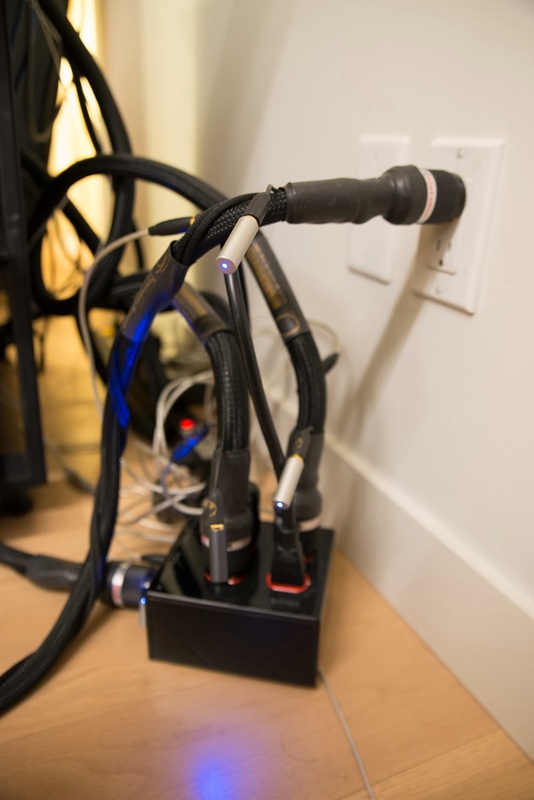 Plugged into the wall is a "Tesla T3 SE" cable connected to a "PowerCell 4" (basically functions as a 4-outlet power bar). Coming out of the PowerCell on top are 2 "Tesla T2 SE" cables and an Audience power cable (not evaluated here). The blue lights come from the "Enigma Bullets" which I'll address a little later. My friend has been listening with them for >6 months so there's no issue with new cable "break-in". 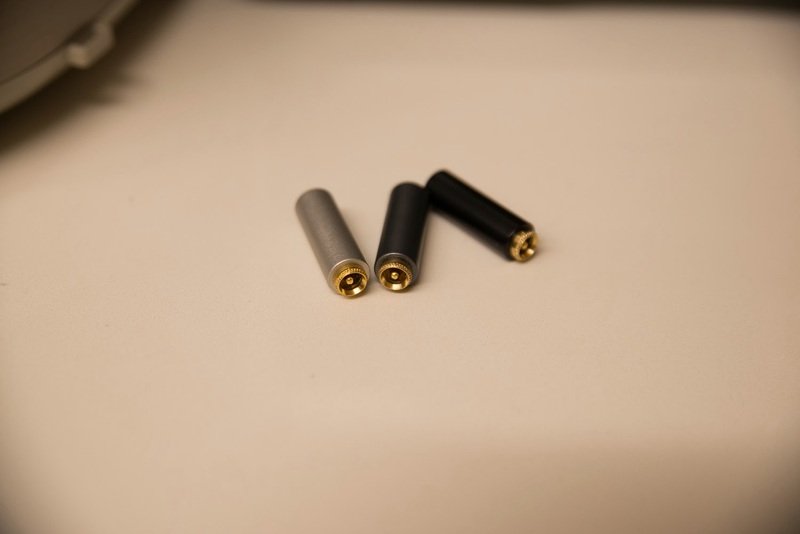 I'll spend some time talking about the T2 SE since it's the cable directly connected to the Oppo. You can have a look at the manufacturer's information at their website if unfamiliar with this cable. Although not the "top of the line" AC cord, this unit has most of the "headline features" which supposedly provides benefits. It's got some kind of silver & copper conductor construction, "Tricon" and "T2" (?) geometry, high quality "G 07" IEC plugs... Then there's the "Quantum Tunneling" - some kind of 2 megaV pulsatile "treatment" that transforms "the entire cable at a molecular level" (what molecule(s) they did not say...). Check out some more pictures here. Finally, we have the well advertised "Active Shielding". The claim here seems to be that using an electrically active (DC current) shield improves noise level and some how "greater frequency extension from top to bottom." We are of course not graced with any charts/graphs/details as to how this was determined. Despite the huge calibre of the T2 SE cable, it actually feels rather hollow so it's hard to tell what wire gauge is being used inside. Cute, solid-feeling metal pieces with an electrical connector on one end and a little LED (the blue light shown in the 1st picture) on the other. They get warm plugged in to the DC source so I whipped out the multimeter and got 1400-ohms resistance for the black one, and curiously 1200-ohms for BOTH the silver and gray ones - not sure if this is supposed to be the case. Notice the $399 MSRP Synergistic "Quantum Line Strip" QLS-6 - power bar, no surge suppression - also "Quantum Tunneled"! A basic wall plug AC adaptor, 24V 300mA switching power supply you can order bulk from ENG Electric in China or Taiwan. Unless I'm mistaken, asking price for one of these is $125 (here)! Here's the manufacturer's page on the PowerCell 4. It functions as a 4-outlet power bar. I don't think there's any surge suppression on it. It felt surprisingly light weight to me. I have no idea what they mean by a "magnetic cell" or what benefit that affords (?are there magnets in there?). Also, the comment about "The PowerCell 4 also improves picture quality on any display, with darker black levels, better color saturation and a more 3 dimensional picture, simply amazing" should be objectively assessable. Finally, between the wall outlet and PowerCell 4 is the hefty Tesla T3 SE power cable. Again, here's the manufacturer information page. Looks to me that the main difference is the higher number of conductors (ie. thicker overall effective wire gauge) compared to the T2 SE above. You can read more about this PowerCell & T3 SE combination in this subjective review. T3 SE cable plugged into wall. 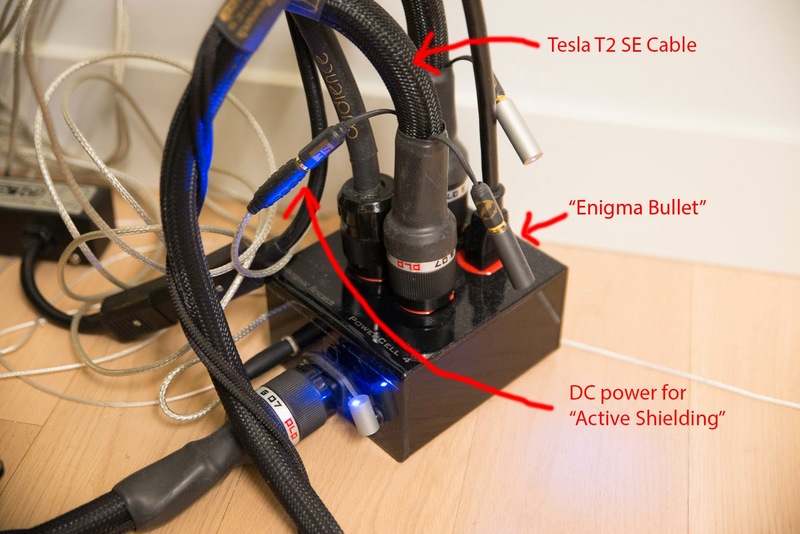 Notice its own lit "Enigma Bullet" and you can see the "Active Shielding" winding wrapped around the main power cable. 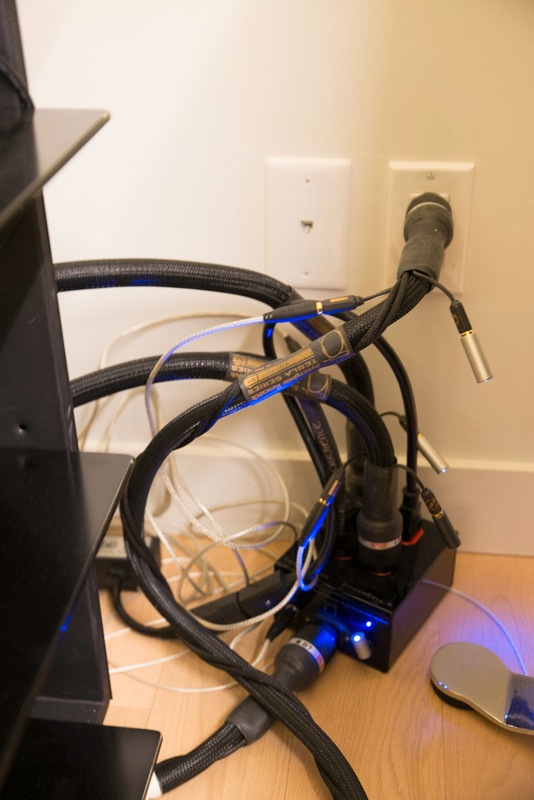 My friend lives in a multilevel condo and I figured that if indeed an expensive AC cable system is capable of cleaning up the noise coming through the outlet, then this is the kind of environment to demonstrate an advantage! Of course, the comparison must be to a generic IEC cable, but lets make the generic AC cord even more disadvantaged - I'm going to add a 12' length of inexpensive extension cord to it. Measurements will be taken off the RCA output from an Oppo BDP-105 which he uses (the Oppo is an excellent USB DAC based on previous tests a year ago). This also gives me an opportunity to show a few measurements beyond my usual ASUS Essence One / Transporter / TEAC UD-501 trio of DACs. As you can see... The expensive Synergistic power cords + PowerCell made absolutely no difference to the Oppo's analogue output compared to an absolutely generic power cable attached to extension cable for both standard resolution 16/44 and hi-res 24/96 test signals. Inter-test results were essentially exactly the same in all 3 conditions. No evidence here that the Active Shielding made any difference either. 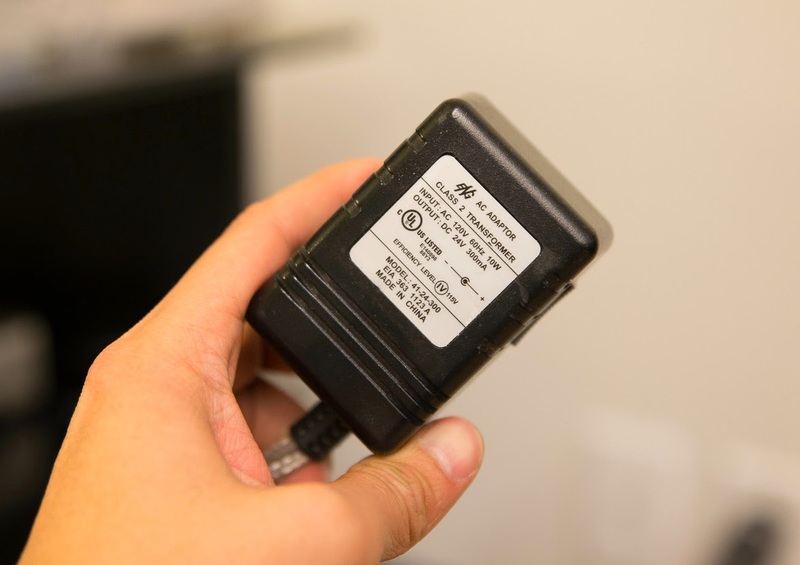 Within the limits of the testing equipment - the EMU USB0404 as ADC - there is no difference using the Synergistic power cords with the Oppo BDP-105 compared to a generic 18AWG IEC power cable with extension cable in a multilevel condo building near the heart of the city. Although the USB0404 isn't to be used professionally as test gear, as previously shown, it is a capable "measurement" device able to demonstrate very tiny effects like the -90.3dB LSB test, effect of digital filters, and slight differences between similar SPDIF digital transports; all of which I believe would be below the threshold of hearing for the vast majority of people. As such, I do believe the results above to be accurate and reflect reality when it indicates there is zero difference. Could these fancy cables improve the sound from other devices like power amps or older technology like tube gear? I don't know... Remember though that tube equipment have much higher noise floor in general so even if this cable could lower it, the difference would likely be irrelevant. As usual, if power cables could substantially improve sound quality, why has there not been good evidence after all these years? I've often wondered why cables like these are not subjected to objective measurements like speakers, DACs, pre-amps, etc. in magazines like Stereophile using their fancy measurement devices? (Heck, many of these cables cost substantially more than good components!) 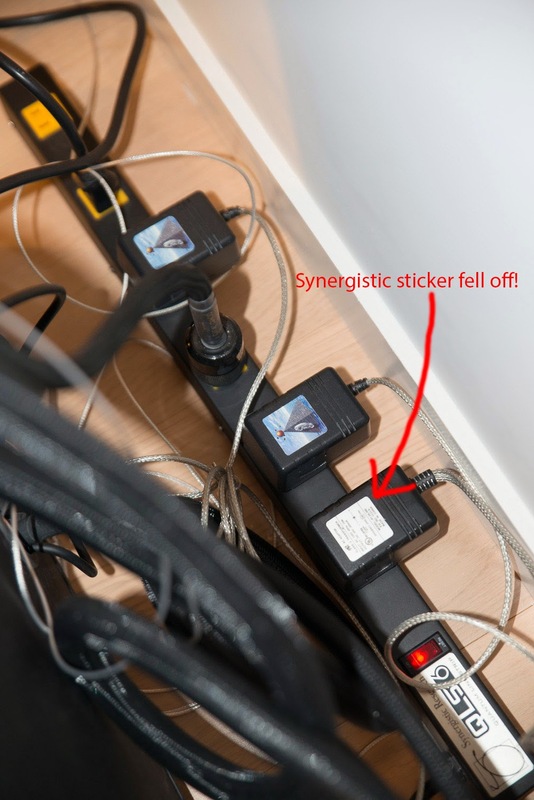 Furthermore, right on Synergistic's web page, we are told that the "Active Shielding" lowers conventional parameters like noise floor and frequency response ("this closed circuit design not only improved subjective performance, but also made our cables measureably (sic) quieter, thus improving detail with greater frequency extension from top to bottom..."). So where are those measurements, and under what conditions? Peripherally, gimmicky marketing terms like "Quantum Tunneling" as it refers to the process they use really should be better explained (seriously, any time a company starts referring to Quantum-anything in the macroscopic world, it's best to be cautious). Finally, if sonic improvements can be made with a cable, did Oppo not bundle one they've tested to be optimal despite all their other engineering efforts? 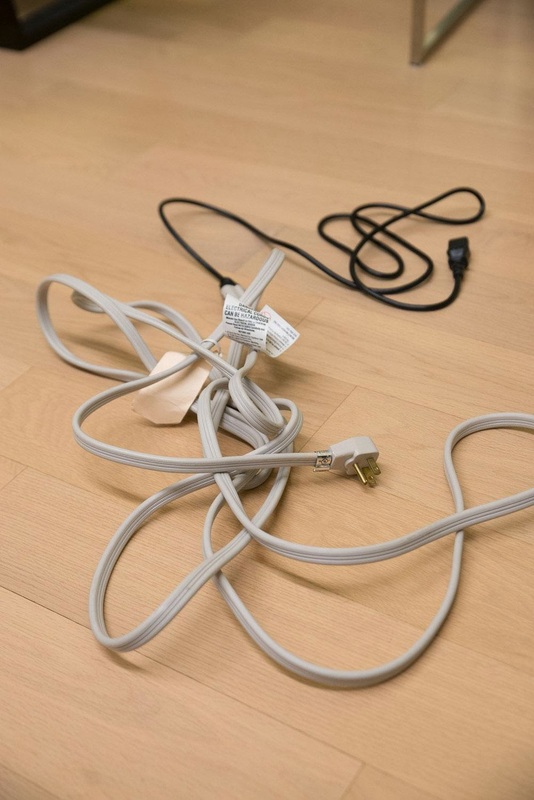 Subjectively, I have heard my friend's system with the Synergistic cabling and with the generic power cable (as well as other systems with fancy cables but not to this degree of testing). To be honest, there's really not much to say subjectively with any certainty doing a tedious A/B/A trial. Do I think the Synergistics make the sound better? I'll go with the objective results and say this is most unlikely... Without a special setup, it's essentially impossible to do an accurate A/B comparison since there would be too much delay between cable switches, Oppo boot up, then start playing a song to really make any reliable comparison based on auditory memory of mental markers for high-fidelity. If audio qualitative differences were big enough, of course this could be a trivial task, but for at best tiny differences as in this case (if any), I do not believe this is possible based on research into the limitations of echoic memory. Good to see the measurements at least did not show any worsening using the exotic cables. All I can factually say is that the Oppo BDP-105 sounds great (and measurements demonstrate this high fidelity) through his system irrespective of which power cable(s)! When it comes to power cables in my home system, my internal wiring is standard 14AWG copper and that's the "best" it's ever going to get in terms of power distribution. I don't see how passive wires can do anything for noise floor or "control resonance" or such beliefs. I'm quite happy with generic shielded 18AWG IEC cables for low power devices like the DAC, pre-amp, DSP equalizer. For higher power devices like the monoblock Emotiva XPA-1L and Onkyo AV receiver I have 16AWG shielded generic cables. I do not believe I hear a difference between the 18 and 16 gauge cables with the amps (in fact at one point I had an 18AWG cable on one monoblock and 16AWG the other and notice no stereo imbalance, noise, etc... even at high volumes) but I guess at least it makes me feel good that I did a little more to feed the neurosis :-). As usual, please feel free to drop a link if you come across other tests on cables such as these; especially tests which have shown significant differences. - I've been listening to Eric Bibb's Blues, Ballads & Work Songs (2011) recently and I'm enjoying this Opus 3 SACD (was listening to the PCM layer on my friend's system the night of the Synergistic testing in fact). Easily accessible and great resolution! - Mark Waldrep (aka "Dr. AIX") runs a nice blog at Real HD-Audio. Opinions and insights from a respected figure in the high-fidelity/audiophile world who clearly "keeps it real". If you haven't, I would highly recommend having a listen to some of AIX's recordings; especially in multichannel and the samplers provide a taste of his work. He posted an amusing recent anecdote on the use of a standard 75-ohm cable for digital audio at CES 2014. Also calling out the snakeoil on these "treatment" products sold through Blue Coast Records - I wonder if they work better in PCM vs. DSD :-) (Dr. AIX's blog post). Respect. Enjoy the music... And keep it real, folks :-). PS: A big thanks to my friend for offering and helping with the testing - he has of course reviewed this write up for accuracy.